Interlocutor: Now I want to continue with the famous "War of Troy" I have some scheduled questions here to make a quick “ping pong” because the time of the session passes by very fast. Do you agree? Ruanel: Yes, It seems good to me, you can start. Interlocutor: Did Homer exist? I ask it because there are historians that question about it and they speak about several authors. Interlocutor: Was he prolific at writing? Interlocutor: Where was he born? Ruanel: He was born really in the North coast of what now is knows as Turkey. Then he moved to the part of Greece. Interlocutor: Nothing to do, then, with the cities that dispute his birthplace, Argus, Athens, Rhodes, Salamis, Cyprus, Esmyrna? Ruanel: Correct, the majority are cities from Greece. Interlocutor: Was Melesigines his real name? Ruanel: Yes, that was his real name. Interlocutor: Was Homer truly blind? Interlocutor: When was he born? Ruanel: In the IX Century IX B.C. Interlocutor: Did Homer wrote alone all his works? I refer especially to Iliad and The Odyssey. Ruanel: Yes, he wrote them alone, although some detractors say he didn’t. Interlocutor: Was Homer by chance the reincarnation of somebody who lived in Troy in the time of the famous war? Ruanel: I know what you are looking for, but the answer is no. 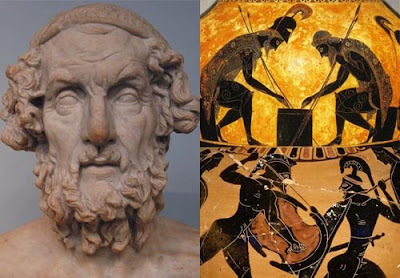 Interlocutor: Did The so-called "Trojan War" exist? Ruanel: Yes, it existed, and also the characters, but not all the cases their names are those that Homer gave them in Iliad. And neither the story of Homer is completely reliable, because there are many things invented. Interlocutor: Obviously the famous “Trojan Horse” didn't exist. Ruanel: It doesn’t make sense something so childish. Interlocutor: I was guessing something like that. And the so commented Achilles heel? Ruanel: Achilles didn't have any invulnerability and even less in the heel, his armor simply didn't shield him and a poisoned arrow crossed him and he died in 20 minutes. Interlocutor: Was he lucky or he had skills to be able to survive so much time? Ruanel: Some the two things. In fact he was a warrior who had a lot of skill in combat. Interlocutor: Was Paris the one who killed him with the poisoned arrow? Ruanel: Yes, but Paris was not his name. This name was invented by Homer. Interlocutor: Did the Famous Helen have something to do with the war? Ruanel: Her name was not Helen either, but she existed. Interlocutor: Did Paris abduct her like Homer wrote? Ruanel: No, they fell in love. Helen was with the king of Esparta for charity, besides, he was also a much older man than her. Helen meets Paris and she leaves with him. There is no kidnapping. Interlocutor: But the war had something to do with this fact? Ruanel: Yes, it had to do, because the wars take place for two reasons, maybe not at the present time, but in the old days yes, because the wars were smaller and the passions bigger: on one hand, because of affairs, spites and those things, and on the other hand because of longings for power, economic issues, etc. Interlocutor: Definitely, any excuse is good to start a war. Ruanel: That’s the exact point. Interlocutor: Does the movie "Troy" have similarity as to the cute blond guy Brad Pitt? Ruanel: No, because it is very Hollywood-style. For example, they depict Achilles as a righteous man and actually Achilles was very cruel. Interlocutor: Well, but the movie is right because Helen was not kidnapped by Paris but rather both of them fell in love. Ruanel: In that aspect, yes. Interlocutor: How did Homer know all these things? Was he a medium maybe? Ruanel: That’s right, he communicated with Entities of Light. Interlocutor: Did Homer know about this communication or he believed those things came out from his imagination? Interlocutor: Didn't Homer know then that what he wrote was real? Ruanel: That’s correct. Homer even received messages about Atlantis. He was one of the few of the antiquity who spoke about it. Interlocutor: What is the percentage of historical accuracy the Iliad has? Ruanel: It almost has 90% of accuracy; except by the names that are invented. In addition, Homer has exaggerated some things. Interlocutor: Was there really a Siege of Troy 10 years? Ruanel: No, that’s absurd. Where would they get so many foods to resist one decade? Interlocutor: How long did it last then? Ruanel: At the most 6 months, and this time is even too much. Interlocutor: Why did Troy fall? Ruanel: Troy fell because it was not unassailable at all. You have to keep in mind the time in which that happened. There were no castles like those of the Middle Age, with their moats and their drawbridges. Interlocutor: Nothing to do then, with the movie? Ruanel: Absolutely not. The movie exhibits Troy as a fortress and in reality it was like that. Don't forget that Hollywood magnifies all things. Interlocutor: The movie shows Achilles challenging Hector and he accepting the challenge. Did something like that happen in reality? Ruanel: Yes, that was real. Interlocutor: Was it something common that two warriors fought alone in front of everybody? Ruanel: No, what happened is that Achilles was extremely conceited. Interlocutor: Is it real the scene in which Achilles kills Hector and then he drags him through the dirt taking his corpse away? Ruanel: Yes, it is real. Interlocutor: Was Homer a similar medium to Benitez with its "Horse of Troy”? Ruanel: What happens is that Benitez put more things that Homer. But Homer, although he was more faithful to the messages he received, he also magnified some facts. Ruanel: Yes, but not with that name. Interlocutor: Was Troy completely destroyed by fire? Ruanel: Yes, the fact is correct. Interlocutor: A wealthy German merchant called Heinrich Schliemann not only discovered the city of Troy, demonstrating that it existed, but also others more, I believe that it was reconstructed nine times. Ruanel: No, not so many times. It was reconstructed only twice. They simply modified the constructions, by removing or adding things. Interlocutor: I understand. When did the conflict take place more or less? Ruanel: Around the XIII Century B.C, some hundreds of years before the birth of Homer. Interlocutor: To conclude with this topic, was there some kind of homosexual relationship between Patroclus and Achilles? Ruanel: No, Achilles was not homosexual. Interlocutor: Well, all the questions that I had scheduled are already responded. This entry was posted at Saturday, August 22, 2009 and is filed under History . You can follow any responses to this entry through the .